Zonal forest associations are practically absent from Eastern Siberia and the Far East. Both are predominantly mountainous regions and in the Pacific the influence of the ocean modifies zonal successions. 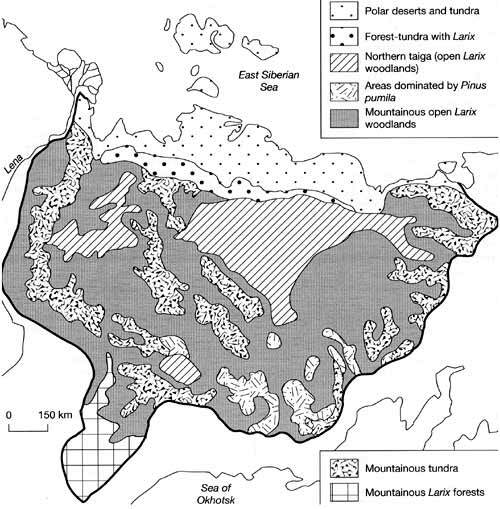 Montane forests and the Far Eastern taiga are discussed below and this section discusses the taiga of the East Siberian plateaux and valleys, the Sea of Okhotsk coast, and the Amur basin (Figure 9.7). The formation of forests in Eastern Siberia is limited by the extreme climate. The lowest temperatures in the Northern Hemisphere occur here with the absolute minimum of -71 °C registered in Oimyakon. Similar to Central Siberia, precipitation is very low and less than 20 per cent of it occurs in winter. The depth of snow cover is consequently small, between 20 cm and 30 cm. In this rigorous climate, open forests composed of Larix gmelinii with thickets of Pinus pumila and Betula middendorfii develop (Figure 9.7). In places, forest cover breaks down giving way to thickets of Pinus pumila, Betula middendorfii, and in the eastern regions, Betula lanata. In the maritime climate of the Sea of Okhotsk coast, winter temperatures are much higher than in Eastern Siberia (the mean January temperatures vary between -20°C and -23°C) with frequent thaws, abundant snowfalls, and strong winds. Summers are cool, with mean July temperatures of 12-16°C. The lack of heat in summer predisposes the development of larch forests formed by Larix ochotensis (endemic to the Sea of Okhotsk coast), L. cajanderi (which occurs at some distance from the coast), Picea ajanensis, Pinus pumila, and Betula lanata. The latter is a montane tree, which can endure severe climate and grow on thin soils. In coastal forests, tree growth is hampered by strong winds and ice abrasion and trees often develop stunted shapes. In the montane valleys, stands are well developed and form closed forests. The taiga, which occurs in the Amur basin, has a complex composition of vegetation which distinguishes it from the rest of the boreal zone. Ecosystems of the Far East comprise a wide spectrum of species representative of the Okhotian, East Siberian, Dahurian, and Manchurian floras. The mixture of plants, which differ in origin and ecology, make it a truly transitional region. Southern Manchurian species (e.g., Quercus mongolica, Juglans mandshurica, and Vitis amurensis) frequently occur alongside the typical taiga species and in the Amur valley they are found at 54°N. The Dahurian element, typical of the southern Transbaikal region, brings herbaceous species, such as Tanacetum sibiricum and Leontopodium sibiricum. These plants occur mainly on the northern slopes of the Amur basin in the western parts of the region but are also found on the Pacific coast. The East Siberian flora penetrates from the north-west. Larix gmelinii and Picea obovata dominate in the habitats on permafrost, particularly in the basin of the river Zeya. Picea ajanensis and Abies nephrolepis with an admixture of Betula lanata, the typical representatives of the Okhotian flora, occur in colder habitats such as northern slopes or valleys with a microclimate controlled by the cold air drainage. Because mountains reach a considerable height, altitudinal zonation occurs in the distribution of forests. Forests, composed by the taiga species, develop at higher altitudes while in the lower mountains mixed forests with the participation of Tilia mandshurika, T. komarovii, and Quercus mongolica occur. Both types of forests have a well-developed and floristically rich undergrowth. Ginseng, a species with well-known medical properties, still occurs in the montane forests in the wild.